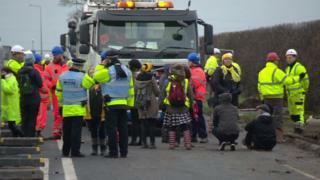 Six protesters have been arrested at a site in Lancashire where the government has granted permission for fracking. The two men and four women locked themselves together at Preston New Road in Little Plumpton at 07:00 BST. Shale company Cuadrilla has been granted permission to start fracking at the site subject to certain conditions. Energy and Clean Growth Minister Claire Perry said all the necessary environmental and health and safety measures has been met. But other conditions have to be met, including supplying the Business and Energy Department with the latest accounts for co-investor Spirit Energy, or a deposit in support of any potential liabilities for decommissioning costs. Ms Perry said: "We already have an excellent, long-standing reputation for safe oil and gas exploration. "Our world class regulations will ensure that shale exploration will maintain robust environmental standards and meet the expectations of local communities. "I have carefully considered Cuadrilla's application and I am content that hydraulic fracturing consent should be granted in this instance." Francis Egan, chief executive of Cuadrilla, said the decision was "a testament to, and underpinned by, our strong track record of running a world-class shale gas exploration site". But environmental charity Friends of the Earth said it was a "reckless and climate wrecking decision". The Preston New Road site has been the subject of continuing protests from local people and campaigners who object to hydraulic fracturing - in which liquid is pumped at high pressure deep underground to fracture rock and release gas. A spokesman for those arrested earlier said they had deliberately breached an injunction preventing trespassers to highlight Cuadrilla's "abuse of the law". Cuadrilla said the six had "unlawfully blocked the entrance". The company said it respected "the right to peaceful and lawful protest" but the campaigners had chosen to trespass despite being "specifically aware" of the injunction. The disruption meant suppliers moving to and from the shale gas exploration site were being delayed, Caudrilla said. A spokesman for the protesters said: "This industry has gone to extreme and expensive lengths to manipulate the law, via a court injunction, to prevent protest in meaningful forms." Anti-fracking protests have taken place at the site for several months but this is the first challenge to the injunction since it was extended until 2020 earlier in July.